E-Carceration: Are Digital Prisons The Future? Christopher Twarowski is editor in chief of News Beat, and former editor in chief and chief of investigations of the alt-weekly Long Island Press. He holds an M.S. in Journalism with a specialization in investigative journalism from Columbia University Graduate School of Journalism and was an inaugural member of the school’s Toni Stabile Center for Investigative Journalism. He also holds an M.A. from the school with a concentration in business and economics. Twarowski has written for the financial and metro desks of The Washington Post and has earned more than 150 local, state and national journalism awards and accolades. Follow him on Twitter at @investigations1. The United States holds 5 percent of the world’s total population, yet 25 percent of the world’s prison population. On any given day, there are more than 2.3 million people locked up in jails and prisons across America—an estimated more than 540,000 incarcerated without ever even being convicted or sentenced—and more than 4.5 million folks on parole or probation. Although millions are imprisoned behind the drab concrete walls and cold steel bars of your stereotypical detention facility, an ever-growing number—estimated as high as 200,000—are instead being clamped with the trendiest weapon of the U.S. prison industrial complex: electronic monitoring. 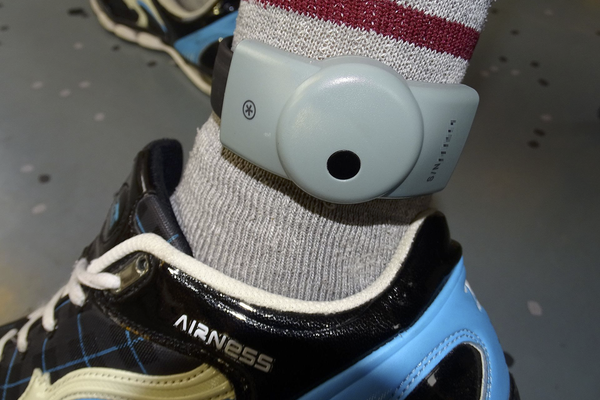 Commonly referred to as “ankle bracelets,” these GPS-equipped devices are praised as cheaper and more humane alternatives—a legitimate remedy, even—to locking up so many within the overpopulated local jails and monolithic fortress-like prisons that have come to visually define mass incarceration within the United States. Though these digital “shackles,” as one detractor calls them, have been utilized by the U.S. criminal justice system for more than 30 years, their use has increased a whopping 140 percent throughout the past decade, with cautionary criminal justice reform advocates sounding the alarm about the tech’s deception, and ramifications. We investigated this issue in “E-Carceration: Are Digital Prisons The Future?,” the latest episode of our social justice podcast, News Beat. Criminal justice reform advocates view the ballooning prevalence of electronic monitoring as just another way for profit-hungry corporations and billionaires to camouflage the true agenda: maintaining mass incarceration’s sinister legacy of punishing the poor and devastating black and brown communities, while those pulling the strings get even richer. E-carceration’s rise, criticspoint out, comes at a time when officials nationwide are making conscientious efforts to decarcerate, and seeking legitimate reforms—the reassessment of money bail, legalization of marijuana, and proliferation of diversion programs, among these. “I felt like I was still under carceral control, which I was,” author, educator, social justice activist, and former fugitive and prisoner, James Kilgore, tells us. A research scholar at the University of Illinois at Urbana-Champaign, Kilgore spent six and a half years in prison for crimes during the 1970s, and more than two decades as a fugitive. He wore a monitor as a condition of his parole. “And the image that always comes to me, is the fact that when I went to sleep at night, I felt as if my parole officer was laying across the bed looking up at me from under the covers,” he says, bristling at the suggestion that being harnessed with such tech is a more compassionate form of punishment. “Most people just said, ‘Well, it’s better than jail,’” continues Kilgore. “And my response was always, ‘Well that’s true, but a minimum-security prison is better than a supermax, but it’s still a prison.’ And by the same token, at an individual level, I would never tell someone, ‘Well, you’re better off staying in prison or in jail than going out on an electronic monitor. “Just like I wouldn’t tell somebody, ‘Well, stay in that supermax where you’re in solitary 24 hours a day, and don’t go to this camp where you can be out free, you know, [for] 16 hours a day, moving around the yard and so forth,’” he adds. Myaisha Hayes, national organizer on criminal justice and technology at the nonprofit Center for Media Justice, and also a News Beat guest, explains that now—as mass incarceration is an increasingly prominent issue—is the time to question these new extensions of prison and assess such strategies before they’re universally accepted. “As we’re in this moment of bail reform, parole justice, all of these different issues within the criminal justice space, we have a real opportunity to take a pause and think about, okay, if we’re going to end monetary bail, how do we actually address harm and maintain public safety in our communities?” she asks. “Or do we want to just find a technological solution to this issue? “I think that’s the issue that we’re having to deal with, and I do think…we have an opportunity now to course-correct,” adds Hayes. Among her and other prison reform advocates’ list of concerns is the fact that the four largest providers of electronic monitors are private prison companies, including the most profitable, GEO Group, which has secured lucrative government contracts to operate federal prisons and monitor people in immigration proceedings. The Center for Media Justice reports thatBI Incorporated, a subsidiary of GEO Group, has government contracts with at least 11 state departments of correction, and earned nearly $84 million in revenue in 2017. Boulder, Co.-based BI has also reportedly earned more than half a billion dollars in U.S. Immigration and Customs Enforcement (ICE) contracts since 2004, according to local newspaper the Daily Camera. Privacy and the possibility of even ensnaring other individuals within close proximity to those being surveilled should also be concerns, contends Stephanie Lacambra, criminal defense staff attorney at nonprofit Electronic Frontier Foundation, another guest on our News Beat “E-Carceration” episode. “Locational privacy has been a concern in the deployment of a number of different law enforcement surveillance technologies, from automated license plate readers to the use of facial recognition,” she explains. It categorically rejects electronic monitoring (EM) as a viable alternative to incarceration; rather, it deems such tech as an “extension” of the very system it’s purportedly helping to rectify. News Beat podcast melds investigative journalism with independent music (primarily hip-hop) to shine a light on the most pressing social justice, civil liberties and human rights issues of our day. “E-Carceration: Are Digital Prisons The Future?” and all News Beat episodes can be listened to, downloaded, and subscribed to via Apple Podcasts, Stitcher, Spotify, and wherever else you get your favorite podcasts.